If you know me even a little bit, you know this article isn’t going to be about the ones on the red carpet. I’m going bigger, much bigger. Stars are part of our everyday life, whether we realize it or not. We see one in the day, and we see thousands at night. Each and every single thing you touch, eat, drink and view—and really, are—was at one point a piece of a star. Billions of years ago, as the universe was a cauldron of giant exploding titans and intense magnetic fields, our atoms were entombed within the bellies of these great beasts and hurled into the cosmos at incredible speeds, smashed together and reformed. Over an incredible amount of time, gravity pulled our atoms together and let us be reborn: not as stars, but as that delicious Chai Tea you paid $4 for (hopefully more, if you tipped like you should!). A size comparison between VY Canis Majoris and our sun. Yeah, that little tiny dot is the sun (with the Earth’s orbit outlined in dotted line. Courtesy photo. It’s pretty incredible, when you think about it. That boring beige car you pass every morning to work, that annoying noxious weed you see in your yard popping up every other week, that yappy little dog that WON’T. STOP. BARKING: They were all at one point part of giant, stellar behemoths larger than the distance from the Earth to the Sun. So what exactly is a star? A star is a perfect culmination of gravity, hydrogen and heat. Within the star, hydrogen atoms fuse at light speeds, releasing incredible amounts of energy each time they do so. This is done an innumerable number of times each second of every day, over the course of billions of years. The release of energy creates heat and light, which can illuminate surfaces billions of miles away. Light from the sun extends as far as the photons, or particles of light, can travel in space, which, provided nothing obstructs it, could theoretically be infinite (or as far as the universe extends, which is finite). From these atomic fusings at the core of the star, everything originates. Because these processes happen, light, heat and energy reach Earth. Because light, heat and energy reach Earth, algae and plants can grow. Because algae and plants can grow, we can eat them and the other things that eat them, and voila! The circle of life. Stars are, quite literally, the life-givers of the universe. Without them, we’d live a very static, cold, dark and bleak nonexistence. All stars are not created equal. Have you looked up at night and seen a dark canvas speckled with flickering lights of countless hues? Well, that’s partly your eyes playing tricks on you, and partly me feigning poeticism. Stars come in a few different shades of red, yellow, white and blue. Why are they different colors? Did someone dye them? No, that would hurt a bunch. Have you ever gone camping? Notice how when the fire is roaring hot, you see strands of blue flame dancing about in the middle, but when the fire dies down, it’s all orange and red? The color is based off the heat. Those different colors you’re seeing at night are all different stars burning at different temperatures: some hotter, some cooler, some like ours. Let’s look at the sun. Well, let’s not literally look at it—that is painful! We are more acquainted with the sun than any other star in the universe, because it is the closest, and it’s given our planet life for at least a billion (probably over a billion and a half or more) years. It has a mass of about 330,000 times that of Earth, making up 99.86 percent of the total mass in our solar system. The sun is a big deal. The sun is a pretty hot place to be, with a surface temperature just shy of 10,000 degrees Fahrenheit. He’s also technically middle-aged, though don’t count on him buying a sports car to make his wife mad. The sun is about 4.6 billion years old, and in another 5 billion years is expected to expand and become something called a Red Giant, which is exactly what it sounds like. It could grow to be a little over 2AU in diameter, which means it would engulf Earth and everything we’ve ever known and loved (we’ll all be long gone by then, one way or another). That means the sun’s waistline will be about 185,920,000 miles wide. Yeowch, get on a diet, sunbro. That’s still tiny compared to the current size of one of the largest stars we’ve ever found. I’m going to need you to sit down for this, and maybe put a helmet on, because your mind is about to blow. Jupiter is about 5.2 AU away from the Sun. If you were as attentive in Geometry as I was (read: not very), the radius is the measurement from halfway in the circle to the outside. The diameter, from side to side, is about 13.2AU. That’s 1,227,072,000 miles. That’s a billion, with a B, folks. 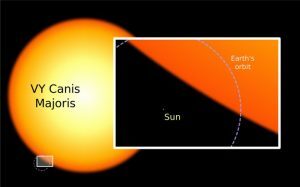 If VY Canis Majoris replaced the Sun, it would overtake Saturn. The Earth would be blasted into atomic fricassee so fast it’d make your head spin, if it hadn’t already been boiled away into particles. If you were in a plane traveling 570 mph, it would take you 245 years to travel from one side of the star to the other in a straight line. In the time it took you to fly a plane through a single star, the United States concluded the Revolutionary war and has gone through every single presidency, including a four year term of the next president or alien overlord. If your brain hurts, you’re welcome. Stars of this size are a bit of an anomaly, but we’ve found ones even larger than VY Canis Majoris. Trying to imagine objects of such incredible size existing throughout our galaxy and our universe as a whole has definitely been a driving force behind my love for all things science. The forces of nature are pretty incredible!